Powell and Mahoney are a Salem, Massachusetts based cocktail mixer company who makes all of their products in Vermont. They are “handcrafted out of small steam kettles.” [source] This description invokes a quaint comparison to the lurid still descriptions that are often on distillers’ websites. 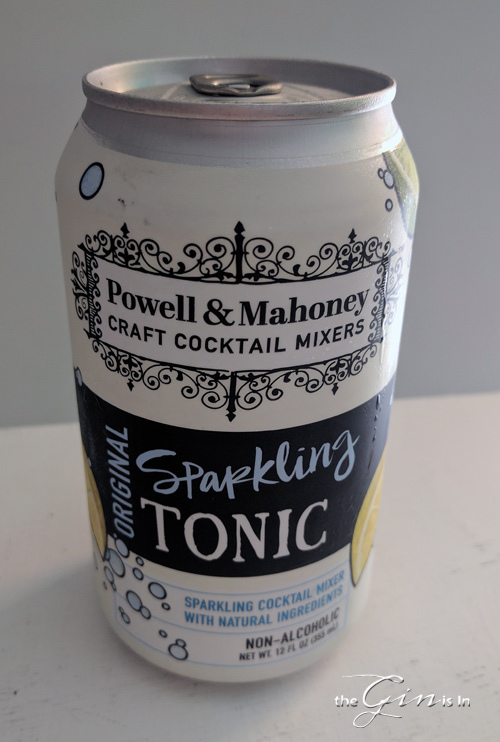 I found Powell and Mahoney Original Sparkling Tonic while in a Connecticut liquor store— sweetened with cane sugar, it also includes natural lemon and lemongrass flavor. It comes in at about 10 calories/oz. (120 calories for an entire can). Though regionally available, they do ship nationwide. Poured, it makes a audible eruption of fizz. It creates an ebullient head before simmering— Powell and Mahoney Original Sparkling Tonic retains a small amount of bubbles, especially on the bottom. The bubbles gently rise with regularity. The nose is delightful and bright. Strongly lemongrass at first, it bares a striking olfactory similarity to Fentiman’s Tonic Water. Unfortunately, in my glass the carbonation comes off almost too quickly! As I go back for another taste, it’s almost flat. But there’s still bubbles in the can, so I go back to tasting directly from there. Pleasant carbonation, Sparkling tonic puts most of its sparkle right up front. The flavor is quite nice. There’s a pleasant lemongrass note mid-palate and a note of lemon rind and pith late. The quinine is exceptionally sharp, but very pleasant. It’s round and robust without any metallic twang. I mixed Powell and Mahoney Original Sparkling Tonic up with Fleischmann’s Gin and I thought it worked quite well in a mixed drink. I added no lime. The gin flavor came on mid-palate, brightened with only a smidgen of lemongrass and citrus from the tonic. Powell and Mahoney Original Sparkling Tonic is a pleasant tonic water with a nice flavor that will not overpower your gin. The bitterness and citrus notes are deftly employed to provide a distinctive lift— but not to take over. I find that sets this tonic water apart from others in the aromatic category. I wish it retained its fizz. With a bit more carbonation and a bit more stickiness, Powell and Mahoney could have a real winning tonic. Overall, it’s still a good priced alternative to common supermarket brands that I would recommend at its price point.